AGRODEP provides a rich set of integrated visualization components to easily capture and present data from the AGRODEP web portal. To this end, it made a large set of dedicated visualization components available to AGRODEP users. The components can be embedded anywhere in web sites or can be printed out easily. See the below component list and choose a component based on your need. Click here to view all user-created visualizations. Displays all African countries. 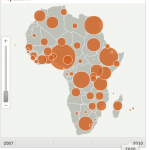 Data are displayed as proportional circles positioned on the centerpoint of a country. The editor can determine the overall size of the circles. Based on the regular map, an extra time slider can display any number of years. The size of the circles aligns with the time slider. Displays all African countries. The countries are colorshaded based on value ranges defined by the editor. 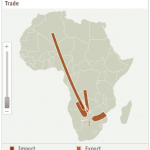 Hovering the map shows name of the country and value. The map can be zoomed and panned. Based on the regular map, an extra time slider can display any number of years. The colors and hover display align with the time slider.